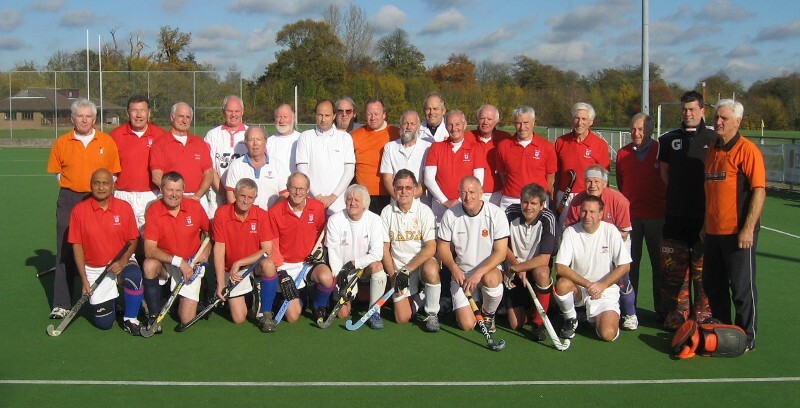 Anybody wishing to participate in a game of hockey on a superb day would have been present at this fixture. With the sun glinting down from a blue sky onto the North Downs and Wye Crown, the bells of St. Mary’s Church Kennington sounding in the distance, a glass of local Kent beer on the clubhouse terrace, the day was highly enjoyable. The LX team lined up against an Antiques team captained by LXer Gurney White, the team being supplemented by some Canterbury players. LX was reinforced by Jamie Allen once again in goal, on loan from Ashford. In the first half the teams were well balanced, with the six LX forwards being rotated very efficiently by Captain Sudesh Nayar, who gave a commanding performance at centre half. On the right wing, Gilbert Grace played with good running, stretching Ashford’s defence, ably assisted on the left wing by Brian Woolcott playing in his usual impeccable style. One excellent cross from Mike Sprange, and another one following a top class individual run from the half way line by Austyn Leaverland, just evaded David Brampton at centre forward, and John Taylor, the Ashford goalie, made two fine clearances. Meanwhile on the opposition’s right side, Adrian Money well marshalled Alan Paterson (RH) and Trevor Hughes (RW) who had space to initiate attacks. It was slightly against the run of play when Brian Hurlow (Canterbury) slipped a neat pass to the elusive Tony Jones (LXer) who scored with finesse to put Ashford 1-0 ahead. In the second half, LX improved their passing, and with Jamie Allen in commanding defensive circle form ably assisted by John Longden, who with his usual stalwart performance, enabled LX to push forward particularly with Peter Ross’s strong running gaining some six penalty corners. From one of these Sudesh Nayar scored with a fierce shot, following David Brampton’s precise injection. Ashford then hit a post, but excellent covering by Max Hamber at right half cleared the danger, to end the game with a 1-1 result. It was excellent to see good support, particularly from the LX Club’s new Chairman, Imtiaz Mahmood-Sheikh, who despite his recent operation turned up to encourage the team, together with all the ladies who attended. The day ended with the usual excellent Ashford hospitality and thanks were given to Tony Post and his catering team, plus LXer John Widgery and Ian Thomas (Ashford) who umpired so well. Finally no game can be arranged without a good Match Manager, and Keith Hedley was very warmly applauded at length by all for all his hard work in making the occasion so enjoyable. LX team:- Jamie Allen, David G. Read, John Longden, Max Hamber, Sudesh Nayar (Captain), Adrian Money, Gilbert Grace, Mike Sprange, Peter Ross, David Brampton, Austyn Leaverland, Brian Woolcott.